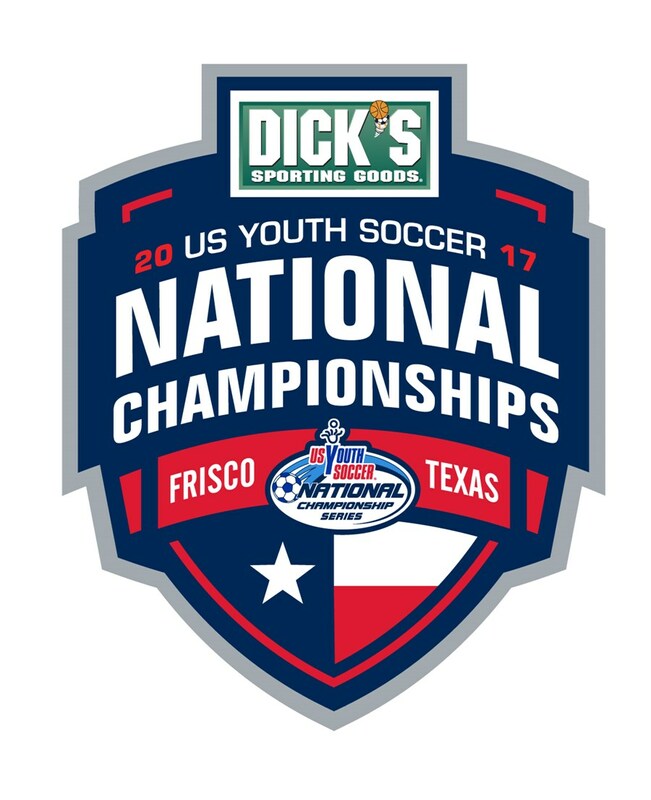 FRISCO, Texas (July 29, 2017) — After several thrilling semifinal games Saturday morning at the Toyota Soccer Center in Frisco, Texas, all final matchups are set at the 2017 US Youth Soccer National Championships. The morning’s excitement will be raised to another level this evening when the champions in the 13U and 14U age groups are decided. Tonight’s championship matches begin at 7 p.m. CT with the 13U Girls final. The 14U Girls final kick off at 7:15 p.m., followed by the 13U Boys final at 7:30 p.m. and the 14U Boys final at 7:45 p.m.
All 2017 National Championship finals can be seen live online at http://championships.usyouthsoccer.org/live/. Several teams are one step closer to realizing the ultimate youth soccer dream after securing a spot in Sunday’s final matches with semifinal victories on Saturday morning. Just two defending champions — 16U Girls Nationals Union 01 Black (MI) and 17U Girls Midwest United FC 00 Royal (MI) — are among the finalists and will have a chance to repeat as the National Champions on Sunday. Two clubs advanced three different teams to the National Championship finals. 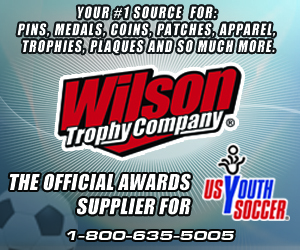 West Coast FC (CA-S) has teams in the 16U Boys, 18U Boys and 19/20U Boys finals, while Nationals Union (MI) has teams in the 14U Girls, 15U Girls and 16U Girls finals. Cincinnati United Premier (OH-S) has finalists in two age groups — 15U Girls and 17U Girls. Nationals Union 02 Black (MI) will face off against CUP 02 Gold (OH-S) in the 15U Girls National Championship final in what should be an incredible matchup of two National League qualifiers. It took overtime, but Nationals Union stayed perfect during with a 2-1 over Legends FC 02 Academy (CA-S). Nationals scored a late first half goal thanks to Jessica Koje’s back post run, but Legends tied the game up early in the second half thanks to an own goal. National Union’s Madaline Novak played the heroine scoring the game winner by finishing a loose ball early in the first overtime period. Legends came close to equalizing having a ball hit the post late, but Nationals Union held off through the final whistle. CUP 02 Gold (OH-S) defeated La Roca PO 02 (UT) 2-0 thanks to two second half goals. After a scoreless first half, Lauren Bastian scored what would be the game winner in the 51st minute of play. Age group leading goal scorer, Kailyn Dudukovich, added to her tally by scoring her fifth goal of the tournament in the 71st minute. It took overtime, but two-time defending champion Nationals Union 01 Black (MI) earned a chance to play for its third straight title. In a matchup of two Michigan sides, Nationals Union edged Michigan Jaguars 01 Green (MI), 1-0, behind a 97th-minute goal from Madison Medalle — her third of the week. Legends FC 01 Academy (CA-S) will be awaiting Nationals Union in the final and look to end the Michigan side’s National title streak. Legends picked up two wins and a tie to finish second in Group A and advance to the semifinals. Once there, the Cal South side used a 45th-minute strike from Brianna Valdez to claim a 1-0 victory over Group B winner CUP Gold 01 (OH-S) and advance to the final. The championship game will be a rematch of a thrilling 3-3 draw when the two teams met on the final day of group play. The 17U Girls National Championship will be a familiar matchup for Midwest United FC 00 Royal (MI) and CUP 00 Gold (OH-S) as these two Region II teams faced each other in the 2016 National Championship final as well as two Region II semifinals. Whereas Midwest United took the National title last year, the matchup has always been a tough contest for both teams. Midwest United advanced to the final match with a 4-0 win over Celtic FC (UT). It was only a 1-0 game at halftime due to a Khloe Hayes goal in the 31st minute, but Midwest United piled on the goals in the second half as Jennifer Blitchok contributed two and Rylee Michaels added one. For CUP, the Ohio South side claimed a spot in the finals after a 3-1 victory against HBC Impact 00 (NY-E). CUP’s Nicoletta Anuci scored the first goal in the 44th minute, and it wasn’t until the 77th minute when CUP earned its second with a Paige Elliott goal. Jordyn Rhodes added the third, and although Nicole Scudero got HBC on the board, CUP walked away with the victory. Midwest United’s Blitchok and CUP’s Rhodes sit on top of the 17U Girls top scorers list with four goals each. Additionally, Avery Lockwood has three goals for Midwest United, while Anna Podojil also has three for CUP, so the final game is expected to be a tight matchup. TSC Showcase (TN) defeated Cleveland FC (OH-N), 2-1 in the National Semifinals. TSC struck first in the 13th minute with a goal from Karlie Paschall. Thirteen minutes later, Vanessa DiNardo from Cleveland FC answered. The winning goal was scored by TSC Showcase’s Peyton DePriest in the 94th minute. In the other 18U Girls semifinal match, Arsenal Colorado Academy 99 (CO) edged Legends FC 99 Academy (CA-S), 2-1. The game was tied until Arsenal Colorado’s Taylor Bee found the back of the net in the 115th minute. The goal was scored on a beautifully placed corner kick that Bee headed into the back of the net. Arsenal Colorado Academy 99 (CO) will face TSC Showcase (TN) in the National Championships final match on Sunday at 7:30 a.m. In group play, TSC Showcase defeated Arsenal Colorado, 3-0. In the 19/20U Girls final, 98 CR Academy (NC) will face ASA Coyotes (MD), who will look to finish their youth careers on top after claiming the 2012 National Championship. Carolina Rapids came away with a 2-0 shutout victory on Saturday, as Mary Givens put the side up early and Faith Adams sealed the game with a 90th-minute goal. Meanwhile, the Coyotes needed a late own goal to get past 2016 National finalist Beach FC 98 Academy (CA-S). Emma Anderson put the Coyotes up in the 13th minute before Beach quickly answered. But in the 77th minute, a long ball into the Beach penalty area bounced off a defender and into the goal to provide the difference in the Maryland side’s 2-1 win. Two undefeated teams, Tuzos Academy 02 (AZ) and Solar Chelsea Red 02 Stricker (TX-N), will face each other for the 15U Boys National Championship game on Sunday. Tuzos earned its way to the final after defeating BRYC 02 Elite (VA), 1-0, in the semifinal. The lone goal of the match came from Jason Villalba, who is tied for second in the age group’s leading scorers list with four goals. On the other side of the 15U Boys, Solar Chelsea came back from a one-goal deficit to defeat St. Louis Scott Gallagher SC Elite (MO), 2-1. St. Louis’ Jacob Karolczak scored first in the 16th minute, but Harvey Castro equalized the game for Solar Chelsea eight minutes later. Solar Chelsea claimed the lead and the win with a goal from Ilean Castorena late in the second half. Solar Chelsea has only allowed one goal in four games, and the age group’s two leading scorers, Riley O’Donnell and Castorena, come from Solar Chelsea’s roster as well. The 16U Boys National Championship match will consist of a battle between Tampa Bay United (FL) and WCFC Armour 2001 (CA-S). After an Alejandro Rodriguez goal in the sixth minute of play, Tampa Bay held onto the lead for the 1-0 victory against Javanon 2001 Black (KY) in the semifinal match. On the other side of the age group, WCFC encountered a back-and-forth matchup with CUP Gold 01 (OH-S) to eventually win, 3-2. WCFC maintained a 1-0 lead in the first half thanks to a goal from Angel Franco, but in the second half, four total goals were converted in the span of 11 minutes. John Grinstead equalized the match for CUP with a header into the back of the net, but Franco and Domenyk Jara responded with one goal each shortly after. Although Quinn Flaspohler put CUP within one point, WCFC powered through and took the 3-2 win. WCFC and Tampa Bay both finished group play with 2-1-0 records, and the age group’s two leading scorers come from both teams. WCFC’s Franco holds four goals, while Tampa Bay’s Jeffrey Cooper has three. In the National Championship final, FC Dallas 00 Premier (TX-N) will face Baltimore Celtic SC 2000 (MD), a side that has yet to lose. FC Dallas 00 Premier (TX-N) defeated Michigan Jaguars 00 Green (MI), 3-2, in Saturday’s semifinal match. The game was tied after regulation, forcing the teams into overtime. The game was decided by kicks from the mark, where FC Dallas prevailed. FC Dallas came in second place in group B to advance on in group play. In today’s other semifinal match, Baltimore Celtic defeated Santa Clara Sporting 00 Green, 4-1. The goal scorers for the Baltimore Celtic squad were Brian Lenzer, Anant Johnson, Justin Gielen and Luke Davis. BRYC 99 Elite (VA) will take on West Coast 99 Wyss (CA-S) in the 18U Boys National Championship match. BRYC earned a spot in the final after defeating Baltimore Celtic SC Christos (MD), 1-0, in the semifinal game as Ryan Moore finished the lone goal late in the first half. The other 18U Boys semifinal led to a 3-2 overtime win for West Coast over UFA 99 Premier (GA). Lukas Ryan put West Coast on the board with a goal in the 34th minute and Ryan Bishop made it a 2-0 game with his 70th-minute goal. In the span of three minutes, UFA caught up to West Coast with goals from Carlos Reyes and John Crawley, taking the game into overtime. Brett Jones claimed the game winning goal for West Coast in the 98th minute, propelling the Cal South side into the final match. The final game will be a rematch of the Group B game from Wednesday as West Coast and BRYC played to an undecided 2-2 draw. BRYC will also have to be on the lookout for 18U Boys leading scorers Lukas Ryan and Ryan Bishop from West Coast. The James P. McGuire Cup final will feature West Coast Haney (CA-S) and Challenger Crew Jrs Gold 98 (OH-N). The Cal South side advanced to the semifinals after finishing second in a tight Group B. That prepared it well for the semifinal, which went to overtime scoreless before Jafet Sanchez netted a 106th-minute winner to push West Coast into the final. On Sunday, West Coast will face Group B winner Challenger Crew, who won the duo’s first matchup on the first day of play. Hayden Parente scored twice, including a 79th-minute penalty kick that proved to be the game-winner in Challenger’s 2-1 victory. Chris Brennan, who assisted on the Ohio North side’s opening goal on Saturday, leads the age group with four goals. Challenger will aim to finish an undefeated week in Frisco after picking up two wins and two draws through its first four games.